Our garage door locks and handles provide many alternative locking methods to ensure maximum security. 'Argosy' and 'Ejector’ use a handle deadlock system. 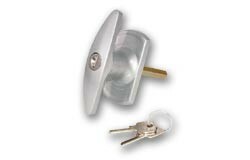 'ASEC' and 'Enfield' use a door bolt which is both locked and unlocked by provided keys. 'LF' and 'Marley' use diamond spindles and square spindles that are attached to garage doors and then deadlocked by keys. The 'PJB Defender' uses a "T" shaped restrictor which is secured with an appropriate padlock (not included). The price gap of the 11 products in this category range from the least expensive £13.01 to the top end of the range £54.20 and indicates the quality and durability of the products for you to choose.